I have many friends who take an interest in my pots of goo and occasionally they send me things. One such friend returning from Essaouira sent me pigment she had been sold as ‘shellfish purple’. Historically, the Moroccan coast was an area much involved in the making of this fabled dye (also known as Imperial Purple and Tyrian Purple) but I expressed doubt that what she had sent was ‘the real thing’ because it is fabulously expensive to produce even a small quantity. Just 5 grams costs around £450.00. But I thought it would be fun to try dyeing with it. I took advice from a specialist colleague, Professor Zvi Koren of the Edelstein Center for the Analysis of Ancient Artefacts (link below). He advised that shellfish pigment is not water-soluble, so that by adding just water I would not get a true solution: I’d get a reddish coloured mixture with the pigments dispersed but not dissolved. I added water and the grains went bright pink. Very bright indeed, as you can see below. Following my colleague’s advice, I reduced grains in a hydrosulfite / dithionite bath in an alkaline solution, at about 60 C. The liquid went completely clear, with the dye matter gathered in lumps. This didn’t look right at all for shellfish purple, which should change to a greenish colour (as with indigo). Nevertheless, I dipped silk into the clear mixture and it came out a bright pink – which does not wash out. So it’s certainly a dye, but certainly not shellfish purple. Two other pointers to its not being shellfish purple: the Essaouira grains are green, and they shouldn’t be. There’s no snail pigment that colour, according to my colleague. It’s usually dark, blackish, brownish, purplish or violetish, but never green. And on top of that, the grains should have a yukky fishy smell. The Essaouira grains smelled vaguely of incense. So this was a fascinating experiment, a story echoing many historical tales of dyes that were not as they claimed. My thanks to Professor Zvi Koren of the Edelstein Center for the Analysis of Ancient Artifacts for his input and advice on testing the Essaouira grains. Friends: please don’t stop sending me interesting things. But as an H&S caveat, pigments and grains bought in faraway places may be toxic or otherwise harmful so you need to be aware of handling and storing them. They are not necessarily what they say on the tin. At a recent course at West Dean my Old Geyser of a fabric steamer developed a problem. The thirty-year old steamer assembly consists of a standard water boiler (the sort to be found in every village hall), a custom-made stainless steel chamber, lid, and perforated base plate. Silks are rolled in paper and stacked upright inside the steel chamber. Water is heated in the boiler, the steam circulates and the combination of heat and damp sets the dyes. The water isn’t held at a constant boil but needs to come up to the boil – and hold it – every two or three minutes, for around two-and-a-half hours. Only, at West Dean, it didn’t. The boil was less frequent than usual, and was held for shorter periods. I was concerned that dyes were insufficiently fixed and suspected a problem with the thermostat. (I should add that West Dean supply a professional Uhlig steamer, but I have always used mine, which holds more silk). Back home, phone calls revealed that a new ‘simmerstat’ is what I required. But during the time since I bought the boiler, Brussels has dictated that EU citizens are insufficiently responsible to handle dangerous pieces of equipment that boil water. (Those in favour of Brexit might enjoy the link at the bottom of the page). A catering boiler will no longer come to a full, constant boil. My new simmerstat was fitted by the technical department, but the gaps between boils seemed longer than I remembered…. or was I just being twitchy? I then discovered that a secondhand Uhlig steamer was on sale, owned by an ex-student. I couldn’t believe this piece of luck – and bought it. It is a solid, stable and well designed piece of equipment, although as with the West Dean one, it does not hold as much yardage as Old Geyser. In the Uhlig I tested several pieces of silk, including three blues which have a tendency to run if steamed sufficiently. No run-off. I tested identical blues in the mended Old Geyser. It now appears to be working well too – so I now have two working steamers. No recycling tip for Old Geyser: he threw a steamy party. Categories: General, History, Indigo, Natural dyes, Pigments, Research into historic dyes, Shellfish purple | Tags: History, indigo, natural dye, Tyrian Purple | Permalink. The work I’m briefly describing here is an offshoot from a joint project. I have been researching mordant pastes (as taught by Michel Garcia) with a dyer friend; eventually we will write up our work because it isn’t yet finished. But the work we have done has made me wonder if it wasn’t the key to finding a satisfying, creative way to use natural dyes in combination with wax resist. This has been an ambition of mine since I went to ISEND* in 2011. It’s there I first came across Michel Garcia, on whose generously-shared research our mordant paste work is based. There are technical problems in trying to combine paste with wax resist. Wax melts in the vat if it’s taken above a certain temperature, and each dye needs at least some heat to fix it. Cold dyeing isn’t an option: it would all take too long. The dyes must take their place in an ordered sequence for colour. The pH of one vat can affect colour of dyes in another layer, the wax can begin to flake off, etc. If the indigo dips are included, there may be as many as 20 operations to create one scarf, as they did in the image below. So it’s time consuming and isn’t going to produce a low-cost item, but I feel I’m getting somewhere at last. The dyes used are weld (Reseda luteola) from a British source, and indigo (a mixture of Devon-grown Persicaria tinctoria and imported powder from Tamil Nadu). The different paste resists give different shades of yellow on the base layer, including the brownish colour visible in small, thin lines and spots which came from the iron in the mordant paste. Follow up post in July 2016: see here. Categories: Exhibitions, General, Indigo, Natural dyes, Wax resist, weld | Tags: indigo, natural dye, wax resist | Permalink. I’m trying to use my Japanese indigo (Persicaria tinctoria) before frost hits and kills it, and it won’t be long. I planted it late this year and have only managed 5 ‘picks’ which were made around 15 days apart, to allow for regrowth. I had enough prepared work to dye in the first vats, but for the last two ‘picks’ there was nothing ready. Not wanting to waste the precious crop I have endeavoured to make pigment, which basically involves reducing (by evaporating) the indigo, in its alkaline, oxygenated state, down to a thick paste, and then powder. This can be reconstituted into a dye vat at a later date. A friend helped me with basic instructions but mostly I had to experiment. I probably wasted some indigo because I didn’t find a way of filtering efficiently. There also seems to be more leaf material in it than I hoped as it looked greeny-blue at paste stage. In a hot, dry climate like India shallow containers of liquid evaporate fast but here it took days, even on the top of the central heating boiler. It was a race to evaporate the goo before it went mouldy. I forgot to weigh the leaves but I think there was about 1 kg, which reduced to 5.3 grams of indigo pigment. There is a full explanation of the way I process Japanese indigo before the evaporation stage here so I won’t repeat the method. With pigment-making on my mind, I went to see the new exhibition at the Burton Art Gallery and Museum at Bideford. It’s called Bideford Black: The Next Generation and it centres on a rare and beautiful black earth pigment which emerges from the North Devon cliffs. In the past ‘Biddiblack’ (as it was known), has been used in paint manufacture, for making mascara, camouflaging military vehicles, in boatbuilding etc., and commercial mining for it continued until 1969. Artists working in a traditional manner, or with traditional materials, have valued its velvety dark strength and subtle tones. I had a chance to try it in the Burton Gallery last week, as can all visitors to the show. Bideford Black: The Next Generation is an unusual and unconventional exhibition and it’s certainly not traditional: participating artists responded to the pigment in diverse and often thought-provoking ways. Links below. I wanted to find out if the pigment could be painted onto sized cloth and the exhibition organisers offered me some Bideford Black to take home and try out. Using a rare pigment 300 million years old was moderately inhibiting and my efforts also felt stuffy and old-hat after seeing the exhibition. Nevertheless, stuffy and old-hat is what I do, so I got on with it. Using the soya milk recipe generously published online by John Marshall (see link below) I stretched and sized silk and cotton and worked experimental pieces. I wasn’t trying to make anything, just seeing what the pigment would do. The black was initially ground in a pestle and mortar and then mixed with more soya milk as a binder. I found that a small amount of gum arabic assisted in holding it together, stopping moisture bleeding outwards from painted shapes. The fabrics now need to cure. Finally in this tale of blue and black, I was lucky to book a place on a monoprint workshop run at The Burton by Grizel Luttman-Johnson. We inked up perspex plates with Bideford Black printing pigment, which Grizel had prepared by grinding and mixing the Black with a binder and linseed oil. We then placed paper on the inked plate and made drawings on the reverse of the paper. Pressure caused ink to be picked up and an impression made on the front of the paper. The plate could be used again to pick up a ‘ghost print’, which created a kind of negative image. It was a very enjoyable day, well-led by Grizel. Categories: Exhibitions, General, History, Indigo, Natural dyes, Persicaria tinctoria, Pigments | Tags: Exhibitions, History, indigo, natural dye, Persicaria tinctoria | Permalink. There is a lot to say about Summer School and I’m short of time, so pictures will have to do their ‘thousand words’ thing. But here’s a quick summary. The Summer School of the Association of Guilds of Weavers, Spinners and Dyers (AGWSD) takes place every two years, in a different location. (If you want to know about the AGWSD, follow the link at the bottom of the post). This year we convened at Moreton Morrell, at an agricultural college in Warwickshire not far from Stratford-upon-Avon. The arrangements for the 17 courses were immaculately prepared by the organisers, although some tutors and students faced various challenges in their allotted teaching spaces. In mine, for instance, wooden wall panels had been fitted to cover walls, and the holes in them had been cut too small to allow a plug into the sockets behind. As we were working in the joinery department, this caused considerable merriment, and resulted in creative arrangements of extension leads – the admiration of all knitters at Summer School. I should add that the department staff came to cut the panel holes larger and were more than helpful. The intensely blue floor was an unexpectedly complicated colour distraction when working on sheer scarves stretched flat. It was hard to see the true colours of the dyes. Needing somewhere to hang drying work, I searched in vain in the workroom for suitable points to fix a line. Eventually a group of rebels set up a washing line, trespassing into the stables (no, no horses, just heaps of old chairs). I taught two identical courses on wax resist which ran back-to-back, and lasted two-and-a-half days each. These short courses, taught by several of the tutors, were designed so that students could follow two sets of studies in the week, and allow the possibility of a shorter stay. I have to admit that as an ageing tutor I found the two-course arrangement tiring. It demanded two inputs of ‘startup’ energy in an already exhausting week: on the plus side it meant that I could teach 20 students, not just 10. Students used a range of traditional tools such as Indonesian tjantings, Ukrainian kystkas, Japanese ro-fude brushes and a Gambian tool made of a handle wound with copper wire. I also brought a motley crew of household brushes, kitchen forks, tractor washers, odd bits of wire and wood which were used to dip into the wax to make marks on the fabric. Students then dyed the fabric surface and built up the work up layer by layer. The students rose to all manner of challenges, whether creative, personal, age, or health-related, as I realised from the ‘thank you’ card given to me at the end. Their work was inspired and inspiring, many tackling creative dyeing for the first time and declaring themselves somewhat anxious at the beginning. Teaching a few students who already had some experience was good for the group, allowing beginners to see more developed work and to talk through techniques and ideas. I was delighted to re-meet one student I first taught 17 years ago, and see how her work has developed. The Summer School organisers faced considerable challenges with the demands made on them by the premises and some of the students, dealing with them with patience and grace. They had set up a full après-teach programme to keep us all out of trouble when darkness fell. Our Monday evening talk was given by Association President Jenny Balfour Paul with characteristic enthusiasm and energy. 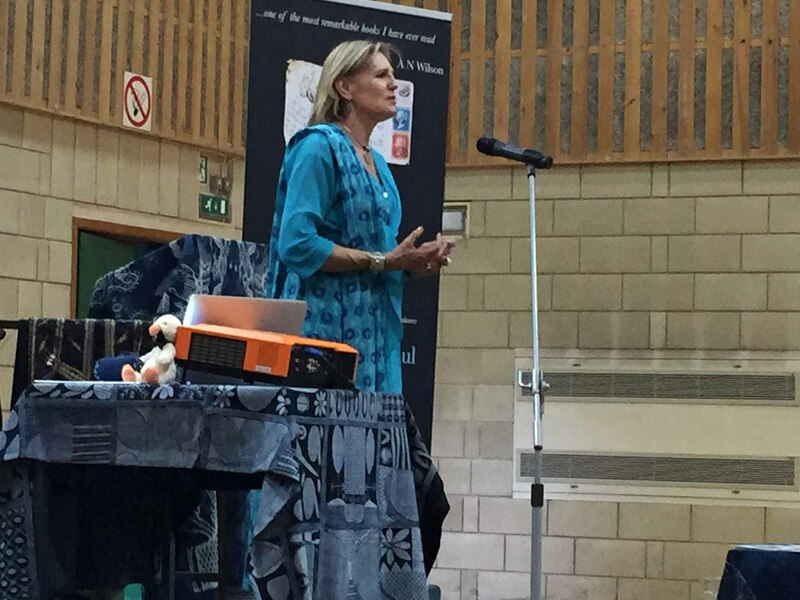 She outlined her travels with indigo, and how it led to writing her recently-published book Deeper than Indigo. Jenny gave a further day of her time to visit all studios and courses the next day, engaging with students and their work. There were tours (I went to RSC Stratford); a Silent Auction; barbecues; a hog roast; a fashion show, a Trade Fair; and a Fifties party to celebrate the Association’s 60th year. Students stayed up into the wee hours to make Fifties outfits and fascinators. I’m afraid I was too tired to join in the fun and went to bed unfascinatored. My thanks to all hard-working Summer School organisers, particularly Chris, plus the support team whose names I do not necessarily know. And thanks to my students, for their trust, good humour, co-operation and enthusiasm. Please look at Katie’s blog, linked below, for a student’s view of my course (and the Rigid Heddle course taught by Dawn Willey) at this year’s Summer School. You can see Katie in the images above, painting the four panels. She based them on the Four Seasons. Categories: blogging, Courses, General, Indigo, Journal for WSD, Silk painting, Steaming, Synthetic dyes, teaching, Tools | Tags: Association WSD, blogging, Eastern European kystka, indigo, Journal for Weavers Spinners and Dyers, steaming silk, teaching, wax resist | Permalink. In my last blog A Purple Pursuit, I wrote about Browning’s Popularity, in which he referred to shellfish dye in a complex poem on inspiration, skill and genius. What I didn’t say, but others wisely pointed out, was the oddity of Browning referring to the dye as blue throughout the poem. Shellfish dye (from the ‘Tyrian shells’) is quite definitely purple and the colour, history and source of Imperial Purple were well known in Browning’s time. So, why blue? Raw silk the merchant sells? I scratched around many sources but failed to find a historical reference, or image, defining Astarte’s eyes as blue. Maybe I have missed something. But the Resident Poetry Advisor says that Browning was more than capable of implying non-existent references, or even inventing them. This seems most perverse, but Browning was a poet and that’s the kind of thing poets do. Putting Browning firmly aside, I happened across a reference to William Gladstone’s Studies on Homer and the Homeric Age. Gladstone (1809 – 1908) was a British Liberal politician, three times Prime Minister, living at a time when politicians digested more than soundbites. Gladstone studied the Iliad page by page, and as he did so he recorded the occurrence of words for colour. What he noticed was rather remarkable. He came across much mention of black, some white, less red, very little yellow, tiny amounts of green…but no blue. Was Homer ‘colourblind’, or unable to perceive colours? Were all Greeks the same, and their perception of colours (and the words to describe them) inherited, building over several generations? It left me wondering whether Astarte’s eyes could have been blue if there wasn’t yet a word for it, which was a head-spinning prospect. Lazarus Geiger (1829-1870), a philosopher and philologist, took Gladstone’s research further and studied other ancient texts (for instance, Icelandic sagas, Vedic literature, and the original Hebrew version of the Bible) finding that none of them contained a word for blue. Geiger concluded that across ancient cultures, words for colour developed in an oddly consistent order. Black was always first, followed by white, red, yellow, green. Blue came next, eventually. If this intrigues you, I suggest you listen to the Radiolab broadcast linked below. It makes more sense of it than I can here, but still left me wondering what exactly was being said. One of the programme’s guests is linguist Guy Deutscher. Listen, particularly, to the account of his little daughter trying to name the colour of the sky. My head can’t get itself round the concept that without an object to attach it to, a colour didn’t ‘exist’ and didn’t acquire a name. But that’s partly what is being said and it leads me to dyeing, and the need to name colours. I was dyeing felt last week, trying to achieve a good range of reds. I used different amounts of mordant, varied the percentages of weld, cochineal and madder and overdyed in different sequences. Small variations occurred in the reds and I sought to describe these to a client in words. Colours need adjectives like ‘bright’, ‘dark’, ‘dull’ etc but one inevitably ends up with a comparison to a universally understood coloured object, such as a poppy, a pillarbox, a brick, a patch of rust, a rose. We take this for granted but it’s very sophisticated, relying on a well-established set of understandings. We often need an object when we describe colour. In her book Tintes y Tintoreros de América, Ana Roquero records the many changes that took place in Central and South American textile practice during the Spanish colonial period. One of the imports from Spain to the New World was an entire vocabulary for textiles. As well as words for machinery, tools, technical terms and cloth and fabric, this included words for colour. These colour words are still alive in parts of Latin America amongst mestizo weavers and dyers, when their use in today’s Spain is long lost. In this case it’s the itinerant word that has preserved the colour, and I find that fascinating. Categories: cochineal, Fibre, General, Historic textiles, History, Indigo, madder, Mordant, Natural dyes, Research into historic dyes, Shellfish purple, Sketches, Tyrian Purple, weld | Tags: cochineal, Fibre, History, indigo, madder, mordant, natural dye, natural dyes, Rubia cordifolia, shellfish purple, Tyrian Purple | Permalink. I’m just home after a fortnight in Scotland, which started at the annual DHA (Dyes in History and Archaeology) conference at the University of Glasgow. I tend to know people by their research – and that’s how they know me. Someone at DHA greeted me as Mrs Orchil: she could also have hailed a Dr Indigo, a Ms Madder and Professor Purple. It’s a friendly conference attended by many world experts in the fields of dyes and pigments, but it welcomes independent scholars like me as well as dyers and textile makers. I wasn’t giving a paper this year so it was an entirely stress-free conference and I sat back and enjoyed it, or at least, all the bits I understood. There are always some technical papers at DHA concerning dye analysis; the ones packed with acronyms, graphs and molecular structures streak comet-like above my head. But factual gems can lurk amongst figures and statistics, so it’s worth not totally tuning out. I took a small ‘suitcase’ exhibition with me about orchil and my research studies; most delegates came to look at it and talk to me, and as a result I learned new things about orchil from new perspectives. The conference tour, after two packed days of papers, took us to Glengoyne Distillery for a fortifying wee dram preceding a tour of the plant, and thence to Stirling Castle where we visited the Tapestry Studios to see the final piece in the Unicorn Series nearing completion. The Glengoyne tour outlined the lengthy procedure for ageing whisky in casks. Casks are made from different types of oak, but have once held sherry (and some, if I remember correctly, Bourbon). The ageing whisky gradually absorbs colour and flavour from the sherry, and the tannins in the oak cask. The two images above illustrate ageing over thirty years in two different types of cask, with coloration intensifying every year. Evaporation is also evident, with around half the liquid being lost over the period. This lost alcohol is called ‘The Angels’ Share’. Above is a small selection of textile-related images from Scotland, most of which I tweeted during our trip. My obsession with dye lichens was rewarded by finding Ochrolechia tartarea alongside Loch Ewe, and Lobaria pulmonaria at Oban; Parmelia saxatilis and P. omphalodes were growing at many locations. Note: I was looking, not collecting. A Gaelic-English Dictionary in a hotel room confirmed that in Gaelic crotal refers to boiling water method lichens, but corcur to orchil lichens. If you want to know what orchil is, or read more about my research and views on dyeing with lichens, please visit this page. Colouring the Nation: The Turkey Red Printed Cotton Industry in Scotland c1840-1940 by Stana Nenadic and Sally Tuckett. Published by National Museums Scotland. From Amazon here. For more on the Unicorn Series, go here for the Stirling Castle story, and here for West Dean’s version. Categories: General, madder, Natural dyes, Orchil research, Research into historic dyes, Shellfish purple, tannins, Turkey red, Tyrian Purple, West Dean | Tags: Association WSD, DHA, indigo, madder, natural dye, natural dyes, orchil, Scotland, shellfish purple, Stirling Castle, tannins, Turkey Red, University of Glasgow, West Dean | Permalink. I planted out my Japanese indigo (Persicaria tinctoria) several weeks ago, having grown it all from seed. This week I picked some leaves and rubbed them on the page of my sketchbook to see if any blue appeared. It did (ignore the buff coloured stain to the left of the image, which is nothing to do with it). From this I knew that I could make a vat from the crop. I began by picking half a bucketful and testing it as a small vat. I achieved a very good blue, which was used to overdue some cochineal-dyed scarves I had shibori-tied ready and waiting. You can see the result in the gallery below. On the second vat I used a whole bucketful of leaves, rammed down hard. I just pick the tips, like tea: not the whole stalk. I sometimes weigh the leaves before processing but the material was wet after rain and there didn’t seem much point. I don’t always strip the leaves from stalks either, so a known dry weight is somewhat academic because the stalks don’t, as far as I know, produce any colouring matter. On the day I dyed the second bucket I live-tweeted the various stages with images and received a good response. I think more and more people are trying to grow, and dye with, their own indigo. 1. I have since found that I don’t always see a blue froth when I whisk up the strained dye bath. Instead, the sherry-coloured liquid darkens and looks greener – but the froth is often colourless. Why? No idea. These days I have stopped using soda crystals and use washing soda instead. Maybe that’s the reason. 2. I have found that leaves are often ready whether or not they have the red/blue tinge shown in the Journal download document. What I have heard since (but don’t know if it’s true) is that you need to use the leaves before the plant produces flowers. 3. I try to encourage flowers for seeds each year and there is some urgency about this as in the UK the plants die with the first big frost. I mark a few vigorous stalks early on by tying a conspicuous ribbon round each one. Then I can’t pick them by mistake. I let these stalks develop flowers as early as possible. Categories: cochineal, Fibre, General, Indigo, Journal for WSD, Mordant, Natural dyes, Persicaria tinctoria, Shibori | Tags: Association WSD, cochineal, Fibre, indigo, Journal for Weavers Spinners and Dyers, mordant, natural dye, Persicaria tinctoria, shibori | Permalink.